The task of accumulating wealth and ensuring long-term financial security is often discussed alongside the idea of winning. And while it's fine to think of financial planning this way, it may be just as important to simply avoid losing. Smart investing involves looking for gains over time, but also escaping costly losses when the market goes down. 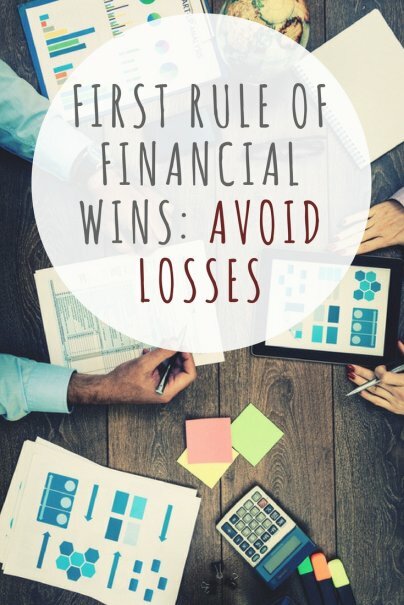 Let's take a look at some ways we can "win" financially simply by avoiding losses. The last thing you want is to buy a stock and immediately see it take a dive. If you are a young investor with a long time horizon, you can usually get away with putting your money in the market at any time. But it is important for anyone to avoid buying stocks when they are overvalued and perhaps due for a correction. It's tempting to buy a stock if shares have been moving upward, because we all like to invest in companies that are doing well. At a certain point, however, share prices can be too high based on the company's earnings. It's important to learn the basics of how to tell if a stock is fairly valued. A price-to-earnings ratio is an important consideration in valuing a stock. A P/E ratio is the share price divided by earnings-per-share (EPS). A P/E of more than 25 is on the high side, though P/Es vary by industry. Take time to learn what typical P/E ratios are for the sector you're looking to invest in. Another rule of thumb to keep in mind: If a stock has been consistently setting new 52-week highs, it may be due for a pullback. If a company's share prices seem overvalued, it's wise to practice patience or look elsewhere for better value. This will decrease your likelihood of losing money on the investment. One common piece of investing advice is to stay the course and avoid panicking when shares of stock fall. This is sensible, but it should be balanced with an awareness of when to cut your losses. Most investors know to avoid investing in too much of one thing. Diversification of investments is a key way to avoid a big loss. But sometimes, it's possible to think you are diversified when you aren't. For example, you may think you are diversifying your portfolio by investing in both U.S. based and international stocks. But have you considered that many U.S. companies already have a huge presence internationally? And even if you think you are diversified with various investments and asset classes, many investments still perform similarly, meaning that you're not as diversified as you think. Financial advisers have varying thoughts on the ideal way to diversify. Of course, everyone's portfolio will differ depending on their age, risk tolerance, and projected retirement year. But the basic tenet applies: Don't be too invested in one area. When you buy and sell stocks and other investments, you'll likely be stuck paying a variety of fees. There are transaction costs for every trade, and maintenance fees and other costs for mutual funds and ETFs. These are costs that are taken out of money you invest, so you not only lose money immediately, but lose out on its potential gains. This can add up to thousands of dollars in the long run. Keep your costs low when you invest, and you'll find that avoiding these "losses" can boost your gains. It's very difficult to time the stock market, and for young investors, it's a good idea to just invest as soon as you can. But it's also possible to avoid big losses by recognizing when the markets may be due for a correction. If it seems like stocks are priced too high based on their earnings, that's one bad sign. A slowdown in economic growth is another, and you should be wary of a spike in inflation and interest rates, too. It's also worth noting if companies are downgrading their earnings predictions for the upcoming quarter, as that could be a sign that business executives are pessimistic. If you recognize any or all of these signs, it may be worth waiting a while before investing too heavily.